Fences are built for many reasons. Fences keep children or animals in the yard and define property lines. Fences also provide security and privacy, and complement other backyard amenities, like pools, spas and decks. Redwood is often the material of choice for fences because it is durable, looks good, and resists warping, splitting and checking. 1. Designing the fence: Most redwood fences are variations of a simple post, rail and board design. 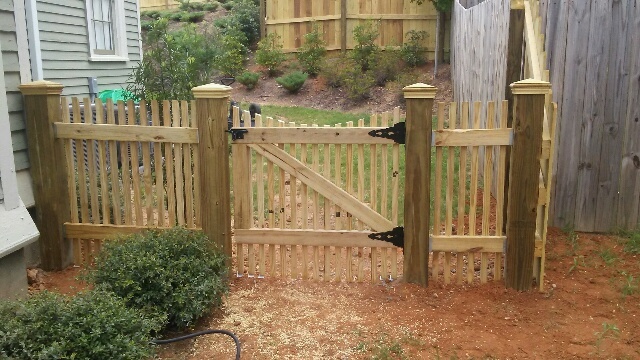 The post and rail support structure is made of standard dimension lumber, while fence boards of different shapes and sizes give a fence its individual style. 2. Choosing quality materials: Most redwood fences are built with knot-textured “garden grades” of redwood. These rugged grades are economical and provide the best combination of performance and value. It is important to use noncorrosive nails and hardware to avoid unsightly stains. 3. Setting redwood posts: Setting posts is the most critical part of the job. They must be straight and evenly spaced, which requires patience and lots of measuring. Construction Heart grade redwood is the right choice for fence posts because it resists decay and insects. 4. Attaching redwood railings: Two or three horizontal rails run between the posts, depending on the fence height. Upper rails should rest on the tops of the posts for support. Bottom rails can be toenailed into place, but the preferred method is to place a block underneath the joint for extra support. Use metal hardware, such as “L” brackets, to secure rails to posts. 5. Nailing redwood fence boards: Nailing the fence boards in place is the easiest and most satisfying part of building a fence. Near the ends of the board, predrill holes before nailing to avoid splitting. For fence boards four inches wide or less, use one nail per bearing. For wider fence boards, use two nails.